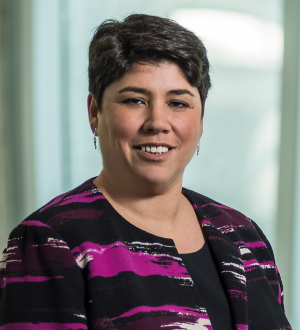 Domenique Camacho Moran is a partner and leads the firm’s Labor & Employment Practice Group. Ms. Moran has represented employers – from start-ups to large corporations – in connection with all types of employment litigation, including matters arising under Title VII, the Americans with Disabilities Act, the Age Discrimination in Employment Act, the Family and Medical Leave Act, the Fair Labor Standards Act, and the New York Human Rights Law. Acting as lead counsel, Ms. Moran has represented management in jury trials and hearings in federal and state courts, arbitrations and administrative proceedings. In 2009, she won a landmark defense verdict for an employer in a class action wage and hour trial. Many millions of dollars were potentially at stake in this lawsuit. Domenique uses her extensive knowledge of employment law to help business owners comply with the many federal, state and local laws, rules and regulations that govern the employment relationship. Ms. Moran often helps companies by providing advice on the practical and legal implications of everyday employment decisions. In addition, Ms. Moran regularly prepares and reviews employee handbooks and personnel policies, negotiates and drafts separation agreements, and provides guidance to employers faced with reorganizations and reductions-in-force. Domenique conducts sexual harassment training for local and national employers that include investment banks, professional sports organizations, retail operations, manufacturing companies and food service providers. She is also a contributor to Farrell Fritz's New York Construction Law blog. Ms. Moran is a dynamic speaker and has significant experience providing training on a myriad of employment-related topics including effective management techniques, human resources fundamentals, litigation avoidance, preventing workplace harassment and discrimination, conducting workplace investigations, and diversity awareness. Prior to joining Farrell Fritz, Ms. Moran was a shareholder at Littler Mendelson, P.C. Ms. Moran is a 1990 Dean’s List graduate of the State University of New York at Stony Brook and a 1993 graduate of University of Notre Dame Law School. At Notre Dame she received the Kraft W. Eidman Award presented by the American College of Trial Lawyers for Excellence in Trial Advocacy and was the Lead Notes Editor of the Journal of College and University Law. Ms. Moran is a member of the New York State Bar Association. She is admitted to practice in New York State, the District Courts for the Southern, Eastern and Northern Districts of New York and the Circuit Court of Appeals for the Second Circuit. In 2013, Ms. Moran was appointed to the advisory board of Make-A-Wish Metro New York and chairs the Walk for Wishes, an annual fundraiser. She serves on the Mom-mentum Committee, presenting "Achieving Extraordinary, Women's Leadership Conference" and is a founding member of the American Heart Association’s Go Red for Women Committee in Queens. She previously served on the board of the Girl Scouts of Nassau County.